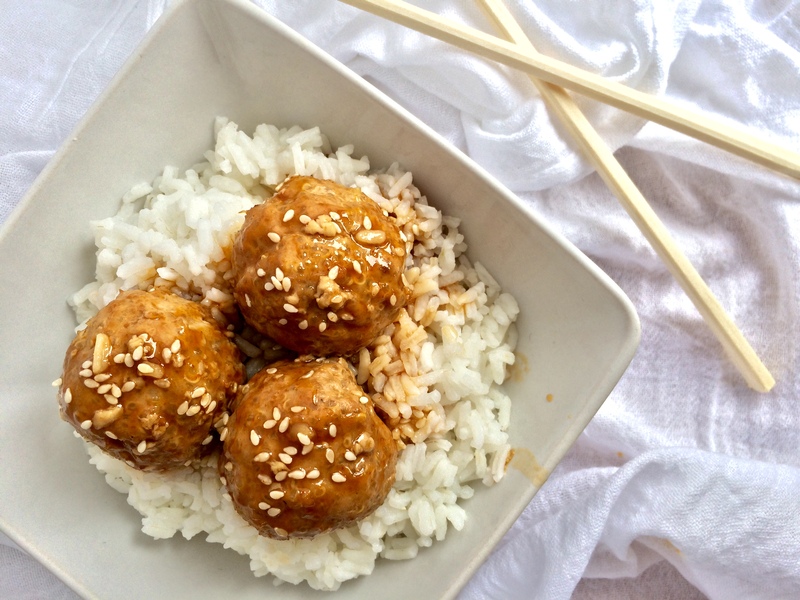 Meatball Monday- Asian Inspired Quinoa Turkey Meatballs. It’s been a while since I’ve posted, so my apologies for the hiatus. I’ve been on this intense career search, and it seems like a lifetime and a half. I always thought I knew what I wanted to do, but I suppose it’s not that simple. I hope it happens soon, I’m going stir crazy around the house. On the bright side, I was accepted into two Masters Programs for Health Care. Overall, a lot has been on my plate and it’s been quite stressful. It seems that my cooking and baking keeps me sane. It’s something I go out to buy, bring home, take time to clean it, bake it, cook it, whatever it might need, then eat it. It’s all up to me, and I love doing it. I get to put in the work, and enjoy the outcome. So on this lovely Monday, I present to you these flavor packed Asian Inspired Quinoa Turkey Meatballs. This is an easy dish to put together with tons of deep, savory flavors in both the meatballs and the sauce. So much so, that you wont even realize how good it is for you. I’ve already posted about quinoa, and you know my obsession with it as well as all the nutrients in it. Turkey is also a great alternative to ground beef or pork as it contains less saturated fat and cholesterol. Definitely the leaner option, and as Rachel Ray puts it, ‘figure friendly’. It’s light but will fill you up quickly, and most importantly healthy. Ever since I started making Asian inspired dishes, I haven’t gone back. If you are craving a spicy, and flavor packed meal, this is the way to go. The plus side about making this, is when you buy the ingredients you have so much more left for future meals. If you divide it up into how many sauces and mixes you get with all that you buy, it’s super cheap! Now you can throw together stir fry, fish, meatballs, burgers, sauces, and much more on any night. These little balls of goodness go great with entertaining, or simply a healthy weeknight meal for you and your friends. I’ve had meatballs at huge parties, small gatherings, family dinners, and by myself. Meatballs are great for any occasion! 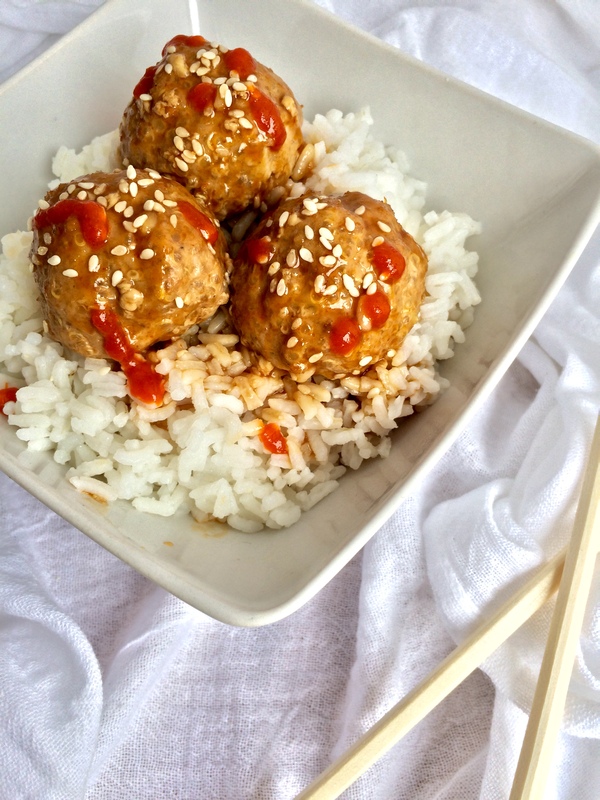 Asian Inspired Quinoa Turkey Meatballs. Preheat oven to 400º F and grease two baking sheets with non-stick cooking spray. In a large bowl, mix together the ground turkey, quinoa, garlic, egg, soy sauce, sesame oil, Sriracha, and salt & pepper (if desired). It might be pretty tough to mix with a big spoon, so I would first mix as much as possible with your clean hands. Then when most of the meat is combined, used a large fork to fully incorporate all the ingredients. Once combined, scoop a tablespoon of meat. Roll into a ball with the palms of your hands. Depending on the size of your meatballs, depends on the outcome of quantity! So if you’re aiming for larger meatballs, you can make them bigger but you will get less. I aimed for 1 tablespoon meatballs which yielded about 25 meatballs. Place the rolled meatballs onto the greased baking sheets. After rolling the meatballs, bake for 18-20 minutes or until lightly browned. If you are making larger meatballs, increase the time to 23-25 minutes. Check to make sure they are cooked all the way through with a meat thermometer. It should read at least 165 degrees F.
While the meatballs are cooking in the oven, you can prepare the sauce. Grab a napkin so you can wipe the droll off your face because it’s mouth watering to the max! In a saucepan over medium heat, combine the soy sauce, rice vinegar, ginger, sugar, sesame oil, Sriracha, and 1/2 cup water. Whisk until all ingredients marry. Let sit for a few minutes. While your sauce is marrying, combine 1 tablespoon water with cornstarch. Mix until well blended and pour into your sauce. Whisk all ingredients together until the sauce has thickened. It should take about 2 minutes, but it will continue to thicken. If it’s not thickening, add a dash or two of cornstarch. 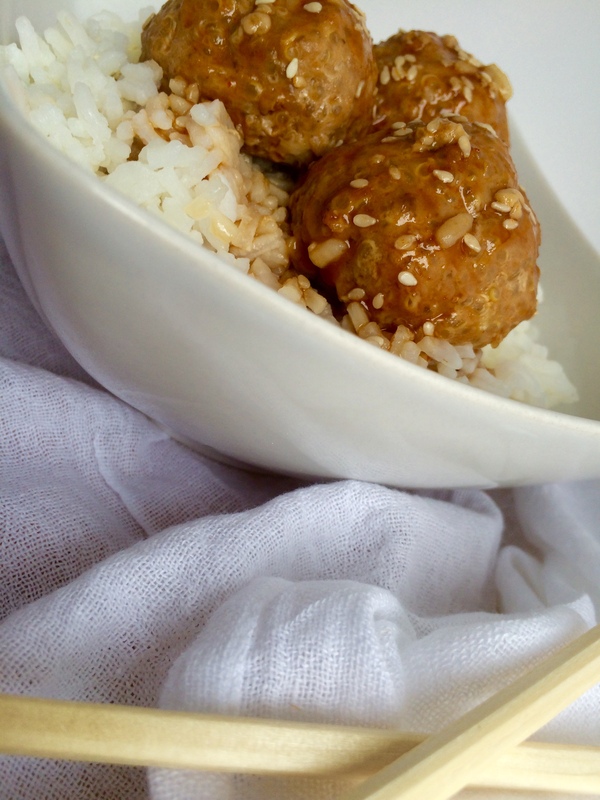 Serve meatballs over a bed of rice and smoother with sauce. Garnish with Sriracha and sesame seeds. Meatballs inspired by Damn Delicious. « Dark Chocolate Chip Coconut Muffins.